The Rev. Claire Nevin-Field, Class of 2006, has been named the 21st Rector of St. Peter’s Church in Philadelphia. Nevin-Field, who has served as Assistant Rector at St. Peter’s Church since 2006, assumed her responsibilities as rector on August 1, 2015. Nevin-Field will be the first female rector in the history of the parish. She succeeds the Rev. 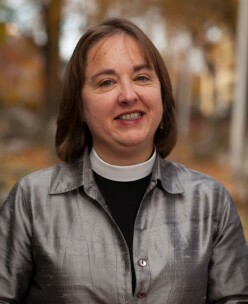 Ledlie I. Laughlin, who has been named rector of St. Columba’s Church in Washington, DC. In addition to her work at St. Peter’s, Nevin-Field serves as Chair of the Diocesan Commission on Ministry, the Church Training Deaconess House Board, and the Board of the Lutheran Theological Seminary at Philadelphia. She lives in West Chester with her husband, Andrew, a systems manager at Vanguard, but will be moving to Philadelphia soon. Her elder daughter, Rache,l is a graduate student at Yale and her younger daughter, Ellie, will be attending graduate school at Georgetown University in the fall.